Usually the space under the bed is used to hide away all sorts of things, whether it be a trundle bed, drawers, or in our case, baskets of dress-ups. 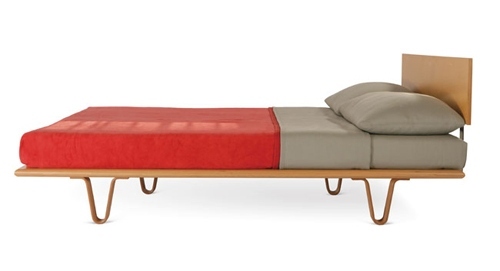 But when the standout feature of a bed is the legs, you have to think clutter-free. The stunning V-leg Bed is hand built with twenty-six layer plywood and supported by matching bentwood legs. Minimalist, simple and available in three wood finishes, this is a bed made to be a modern centrepiece. No monsters hiding underneath this marvel! The V-leg Bed is US$1190 and is available from YLiving who ship internationally by arrangement.